LEXINGTON, Ky. (May 15, 2011) — In a ceremony today celebrating a major milestone for UK HealthCare and the University of Kentucky, the new 12-story patient care pavilion at UK Albert B. Chandler Hospital was dedicated and unveiled to the public. U.S. Rep. Ben Chandler, Gov. Steve Beshear, state Senate President David L. Williams, state Rep. Bob Damron, and Lexington Mayor Jim Gray joined UK President Lee T. Todd Jr., UK Executive Vice President for Health Affairs Dr. Michael Karpf, and UK Chandler Hospital Chief Administrative Officer Ann Smith in a ribbon-cutting ceremony attended by several hundred faculty, staff and community members. "Today marks a significant achievement for the University of Kentucky in our mission to improve people's lives through excellence in education, research, service, and health care," Todd said. "This magnificent, state-of-the-art medical facility provides an environment and the momentum to continue to raise the bar in providing high-quality patient care." Two patient care floors with 128 intensive care and acute care beds will begin serving patients May 22. Also, opening will be many common public spaces including the atrium, chapel, surgical waiting room and a 305-seat auditorium, which will host the Lucille Caudill Little Performing Arts in Healthcare Program. For visitors entering the new patient care pavilion, the hospital's design inspires a sense of calm and comfort in a place that bridges the art and science of medicine. Patients will feel assured they are receiving the most advanced care by some of the most highly recruited and well-trained physicians and health care providers anywhere in the country. "Health care is about people taking care of people, and not bricks and mortar," Karpf said. "But, if we are going to be an academic medical center comparable to the best in the country, we have to have the facilities to support the people we recruit. This hospital puts us on that level." For Chandler, whose grandfather helped break ground on the original hospital named for him, today's dedication ceremony marks the continuation of a commitment to the citizens of the Commonwealth. "My grandfather, as governor, wanted to provide for the health needs of Kentuckians and to train more physicians in the state," Chandler said. "To see how his dream continues to be fulfilled by the University of Kentucky makes me honored to have my family's name associated with one of the most technically advanced and progressive hospitals in the country." Groundbreaking was held in 2007 for the new pavilion and has resulted in more than 2.5 million paid work hours, equivalent to employing 300+ full-time people, during the duration of the construction project. However, today's dedication is about more than those who have spent countless man hours building this "iconic representation of a healthier future," Beshear said. "It is about the people of the Commonwealth and those beyond our borders in need of first-class medical care." 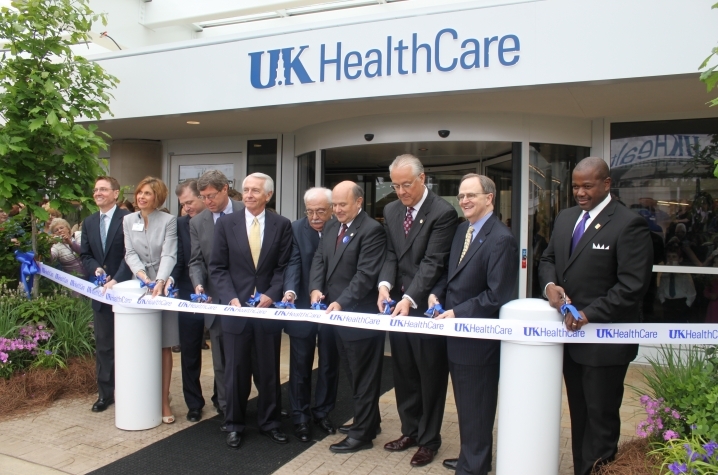 The pavilion also means continued expansion of health-care-related job opportunities in Central Kentucky. The number of full-time employees at UK HealthCare, including Chandler Hospital and the UK College of Medicine, has increased by more than 2,100 people in the past seven years. As well as innovative patient care features, the pavilion incorporates art, music and landscaping that reflect the spirit of Kentucky, including a spacious, light-filled atrium lobby with a stainless steel and mesh fabric sculpture suspended beneath a three-story skylight. In addition, the chapel features walls decorated with art glass inspired by spring in Kentucky, a health education center that also serves as a gallery for a Kentucky folk art collection, and surgical waiting areas that showcase artwork of some of Kentucky's most renowned artists. "These features help make it an empathetic building, and the glass and the light are absolutely spectacular," Karpf said. "People can walk in and say, 'I can relax here for a second. I can get my thoughts together before I have to go deal with all the complexities that I'll have to worry about when I get up on the floor to see my loved one or my friend.'" The new facility scheduled to be completed in phases over the next 10 years will eventually replace the original UK Chandler Hospital and is paramount in the plan to become a premier regional medical center concentrating on cancer, trauma, neurosciences, organ transplantation and pediatric subspecialties. "I am honored to play a role in dedicating this building," said UK Board of Trustees Chair Britt Brockman. "More importantly, though, I am honored to help represent an institution that is dreaming big dreams for changing lives and changing a state." The next phase of construction for the pavilion has already started and is set to open in early 2012 with the addition of eight state-of-the-art operating rooms and one of the country's largest hybrid operating rooms which will combine the most advanced and high-quality imaging technology with surgical operative capabilities. "We hope the people of this state are reassured and proud to have a world-class hospital and a world-class medical team ready to meet their needs and those of their loved ones," Karpf said.